As I googled Muhammad Khalid Akhtar to research his life and times, ­­the search engine showed up results for Che Guevara instead. Akhtar would probably have chuckled and found enough fodder there for yet another goofy story. I know this because I saw his photograph on the back inner cover—smirking toothlessly, cigarette in hand—and the twinkle in his eyes screamed mischief. All of the stories, and the one eponymous novella in the compendium Love in Chakiwara and Other Misadventures are shot through with the same searing glance, and a pen dipped in the poison that is satire. To understand why the legendary Faiz Ahmad Faiz called it ‘the greatest novel in the Urdu language’, one must go directly and drink from the fount. Bilal Tanweer has done the non-Urdu speaking world a great favour by translating the works of Akhtar into the English language. Tanweer’s own economy of prose was demonstrated in his brilliant fictional work The Scatter Here Is Too Great. A tightly narrated set of interconnected stories brought Karachi alive. Both these skill sets—a deep love and understanding of the city, and control over language—stand Tanweer in good stead in translating Akhtar’s stories, maintaining the cutting quality of writing so crucial to humour. Akhtar’s stories are set in Chakiwara, a small division of Lyari Town neighbourhood of Karachi. Its proletarian populace is caught up in the small victories and big miseries of their otherwise unremarkable lives. The primary characters rely on fantasy, horror and otherworldly interventions as much as on pragmatism and manipulation to negotiate their lives. The narrator of most of the stories is Iqbal Hussain Changezi, owner of Allah Tawakkul Bakery. He may run a business enterprise, but prides himself on being a socialist at heart and a collector of writers. Generous to a fault, he can be found lending money and clothes to his less fortunate friends, who never seem to return their debts. He feeds them for free at his bakery, hosts literary gatherings for general intellectual improvement, and assists absolutely anyone in their well-meaning but foolish plans. In ‘The Smiling Buddha’, Changezi and his friend Asp assist their friend Chakori, an out-of-work comedian from Bombay, in becoming an apprentice to a questionable but successful Chinese dentist, who attributes his success to a creepy looking Smiling Buddha statuette. The story shifts very quickly from quirky to noir when the dentist is found murdered. ‘The Love Meter’ is every loser’s fantasy come true. Dr. Ghareeb Muhammad, the local quack, is a scientific genius. He invents the Love Meter, a watch-like device with dials that spin and tells the wearer who loves/ hates them how much. It works around pretty ladies as well as camels and horses. He falls in love with his patient, automatically forfeiting his membership of The Association of Chakiwara’s Bachelors. Alas, just as the love story is warming up, misfortune strikes when the Love Meter reflects that Ghareeb Muhammad’s love interest hates him, pushing him towards madness and suicide. ‘The Downfall of Tanwari Seth’ is the story of an arrogant businessman who grabs property, only to get his comeuppance by a ghostly mirror. 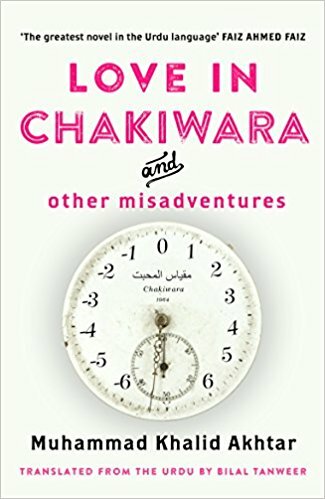 The fourth and final story is the novella, Love in Chakiwara, a pathetically hilarious tale of finding love. Sheikh Qurban Ali Kattar, famous writer of Urdu pulp fiction, falls in love with the local butcher’s lovely daughter. Having been hoodwinked out of royalties by his publishers, he had quit publishing and taken up a better paying job that was beneath him. However, he leaves his job to woo his lady love, which, he is convinced, is only possible by making her believe that he was a highly intellectual member of the professoriate. To this end, he starts donning a gown and convocation cap on a daily basis, and stalks her from his balcony. After achieving the exact opposite result—the butcher threatens to, well, butcher him for gross indecency—Kattar seeks solace in the supernatural. Professor Shahsawar Khan, owner of a goat, a monkey and bear, and an emissary of djinns on earth, hands him a magic ring and advises abstinence even in thoughts. The results of these efforts end in the most comical disappointment, with Kattar uniting with a cat at the destined moment. It is impossible not to laugh out loud while reading the stories about fools and charlatans. It is a world of wretches whose lives are destined to fail by regular worldly parameters. So they milk minuscule victories to the ends of the earth, with a most affable pomposity, and hoodwink with artistic finesse. These sad men are trying hard to fit in, and their attempts still leave them the worse off for it. Akhtar’s story telling is, naturally, old worldly, from a time when stories were not spun directly from political discourses, yet succeeded in being deeply political. In focusing on the have-nots and the has-beens with affection and granting the characters dignity, the author critiques social privilege. He also takes digs at socialists, with their funny vocabulary that is rendered meaningless in the face of the grime of the human condition. The magical and supernatural in the stories tell us that our universe of rationality is frequently an alien, useless language for the marginalized, even when they take pride in using this language. The responsibilities of djinns being divided up bureaucratically in the stories are a telling example. Akhtar is also obsessed with the literary world, whose hypocrisies he shows up by directing taunts at the publishing world and the pretentious airs of litteratteurs. Most of all, he brings alive the city of Karachi, and takes a very affectionate look at the absurdities of his own country through his stories. Overall, the wit is Wodehousian, and Akhtar acknowledges that as well. However, unlike Plum, he presents the shenanigans not of the upper classes, but turns his gaze to the bottom of society, making him—dare one say this—a tad superior in his observations. By the end of the book, the main thing one wishes for, knowing well that any story involving Che Guevara will not be written, is that Bilal Tanweer takes it upon himself to translate the remainder of his works. Sucharita Sengupta is Assistant Professor in the Department of Political Science, Jamia Millia Islamia, New Delhi.